Extremely comfortable, thanks to a flattened instep and wide counter. For a long time, the world's most popular casual shoes were the sole purview of teenagers and man-children. There are other options available, though. 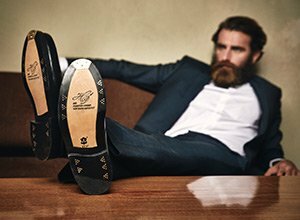 Sophisticated Goodyear-welted trainers made entirely of leather and designed like classic men's shoes are perfect for men with high standards. The history behind trainers hearkens back to 1860, when initial prototypes of these beloved shoes were first circulated in England and the US. The first trainers were distinguished by a flexible rubber sole, which was glued to the shaft by a process—invented by Charles Goodyear—known as vulcanisation. Over the following decades, these light and comfortable shoes were primarily worn to play tennis and during track and field events. The athletic demands of these sports inspired a constant stream of new trainer developments. The term 'sneakers' (the name for this kind of shoe in the States) was coined by the American adman Henry Nelson McKinney, who identified their silent tread as their unique selling point—you could always hear other types of shoes worn back then. In the 1950s trainers became the footwear of choice among young people, who took them up as a symbol of rebellion. Brands such as Adidas, Puma, New Balance and later Nike furnished generations of teens with shoes. Even though they eventually lost their status as a political statement, trainers have become the most popular type of casual shoes in the world. This is due in part to the endless-seeming opportunities for new trainer designs, and also in part to the unparalleled degree of wearing comfort that they provide. Unfortunately, typical trainers are not very durable, since many of them are made under deplorable working conditions in Asian factories. There, shoes are cheaply glued together; when worn, they cause feet to perspire. This is hardly suitable for men with high standards. Discerning gentlemen should reach instead for sophisticated, Goodyear-welted trainers, which combine the comfort of run-of-the-mill trainers with the advantages of leather and Goodyear welting. These kinds of men's trainers are quite difficult to find. Breathtaking in appearance, they seem to achieve the impossible—blending elegant, classic shoe design with sporty trainer chic. The result: visually striking yet comfortable casual shoes. Practical rubber soles ensure a firm stance on slippery surfaces.